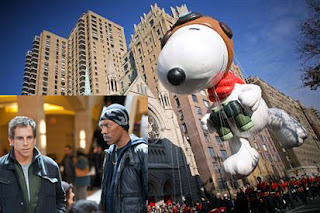 Heads up, Peanuts fans: The caper comedy Tower Heist, which opens nationwide this Friday, November 4, features a key sequence that takes place during the annual Macy's Thanksgiving parade ... and includes plenty of glimpses of Snoopy's massive WWI Flying Ace balloon. Better still, Snoopy's balloon actually figures in the plot, and gets a scripted shout-out from Ben Stiller. Get your tickets early!